MarketSaw - 3D Movies, Gaming and Technology: New Pics Of Batmobile From BATMAN V. SUPERMAN: DAWN OF JUSTICE Reveals Much More! 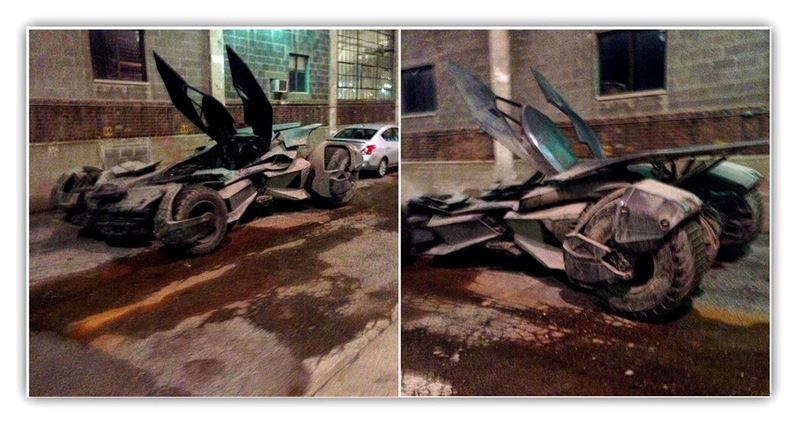 New Pics Of Batmobile From BATMAN V. SUPERMAN: DAWN OF JUSTICE Reveals Much More! A couple of new shots of the Batmobile have emerged from the set of BATMAN V. SUPERMAN: DAWN OF JUSTICE and they don't disappoint. "Batwing" doors, a satisfying wedge design, and clearly rugged engineering makes it look like Batman is ready for WWIII. I guess you'd have to be ready if you were staring down Supes. BvS features some big names and outside of Henry Cavill (Superman) and Ben Affleck (Batman), Gal Gadot is joining on as Wonder Woman, and supposedly Jason Mamoa (Aquaman) and Ray Fisher (Cyborg) are in there too. Mix in Amy Adams, Jesse Eisenberg, Laurence Fishburne, Jeremy Irons, Diane Lane and Holly Hunter and the movie has bank in more ways than one. There's a lot riding on this movie for DC and Warner Bros. GUARDIANS OF THE GALAXY is breaking "superhero origin" movie records and actually has already topped MAN OF STEEL domestically for that box office crown. Labels: 2016, 3D conversion, Batman v Superman, Batmobile, Dawn Of Justice, DC Comics, Spy Shot, Warner Bros.